is the best electronic recipe organizer out there! If you have loose recipes laying all over the place, an overstuffed recipe file, or a shelf full of cookbooks that you never use because you can't ever seem to find what you need/want, then it's time to organize your recipes! Organizing your recipes will likely help you cook at home more often and enjoy healthy meals. As a dietitian...that's what I like to see! Using recipe managament software is a heck of lot easier than organizing recipes by hand! 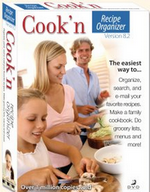 online video demonstrations to help you use this electronic recipe organizer! What are you waiting for?! There's no time like the present. Organize your recipes now!